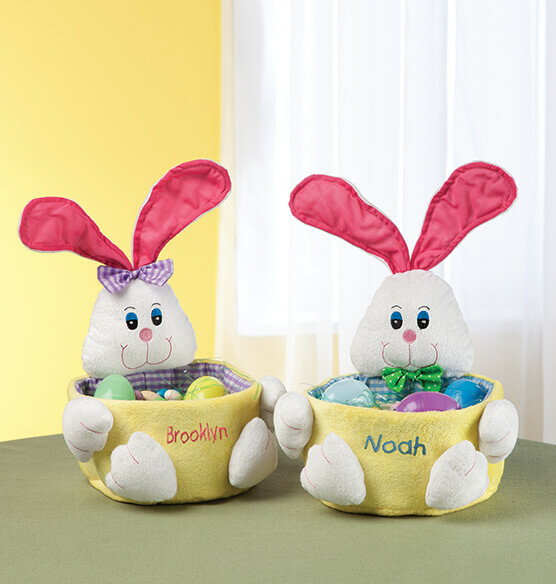 Surprise them Easter morning with this Personalized Easter Basket in plush and gingham fabrics from PersonalizedThings by Exposures. This Easter rabbit basket is a delightful mix of white and yellow filled poly plush with lavender and white gingham fabric touches. 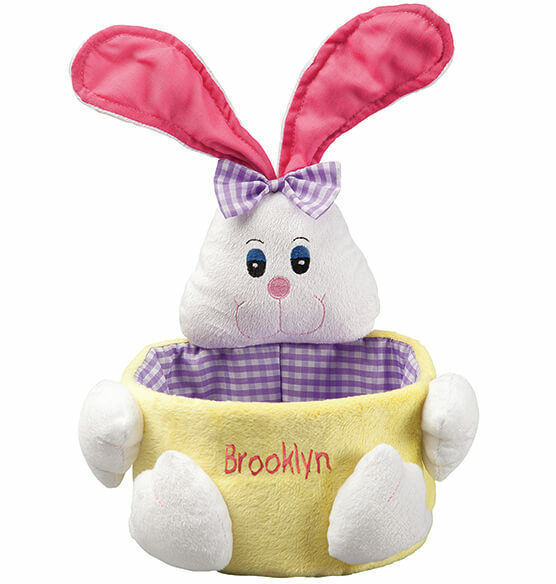 Each personalized basket is hugged by 4 cuddly white bunny feet and topped with a plush white bunny head. The bunny head has adorable detailing from a pastel pink nose and cheerful expression to its oversized deep pink floppy ears. Pastel purple and white gingham fabrics create the jaunty bow on the bunny head and the basket’s lining. 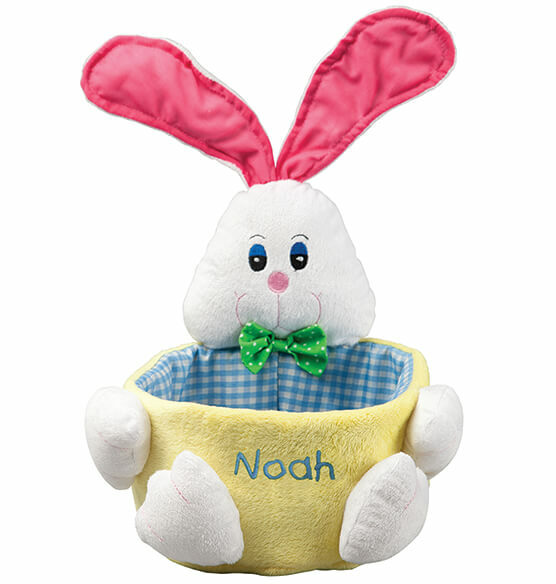 We can personalize each Easter bunny basket with an embroidered name or message; up to 1 line, 12 letters and spaces. Choose pink or blue stitching. At 11" high by 7 1/2" diameter, this custom Easter basket is for boys and girls of any age with plenty of room for Easter eggs, candy and treasures. Plus, it folds flat for storage until next year. Personalized Girl , Plain Girl are not available at this time. They are really cute. Do not have a handle. The Easter baskets I ordered can be kept and re-used year after year not wicker that will be tossed out when Easter is over. They are really cute and my granddaughters will love them. Great detailing and all names were spelled correctly. Too cute to pass up! I'm using this for my daughters 1st Easter and many more! I started with my first daughter and have since purchased this for my other daughter and many family members.With each new addition to the family I send the bunny and they are happy that each child has one. It unites the family.Love it !!! Sent these to my grandsons for Easter. I like the fact that it folds up easily for storage and travel and are light in weight.Taking them to France for grandkids and I can't wait to fill them up with chocolates! I purchased this for my Niece & Nephew's first Easter. They were perfect! My Sister-in-law loved them! There names were just the right size & in beautiful colors. I would definitely buy them again. Highly recommend! Mom of 2 soon-to-be 3! Bought this for all three of my granddaughters and had their names embroidered on them.... HOW CUTE! I hope they will use year after year and remember grandma...and best of all NO FIGHTING on who's basket is who's! (LOL) Love the pink bows... Just wish the inside of the basket was a more colorful material....but I couldn't resist giving to them early as they visited last weekend and they live out of state, filled with their Easter goodies! I've showed these to my friends; you should see more orders coming your way! We ordered this Easter basket for our Granddaughter's first Easter! It was the perfect size and so cute for her! She liked looking at it, and now she will have a memory of her first Easter forever! These really are cute. I bought them to give to the people in my office for Easter. They will look cute sitting on each person's desk. They are large enough to allow several items to be placed in them yet not too large. Good purchase! Very nice personalized easter bunny basket for my grandaughter. Second basket i bought--Got one last year for my grandson. Nice colors--very cute. Needs a handle though--but my daughter sews her own on. Bought 2 , 1 for each grandchild's first Easter. Very cute, nice job on personalization. Love these little baskets. I bought them for my granddaughters. They are so cute. It's good for Easter but they can use them for other things as well - crayons, small toys, or anything else that they think of using. Bought for adult children as well. However, great for Grandchildren. As said before, limits size and amount of treats. Easy to store, if I remember where I put them. All, big and little kids enjoy them. It's just as cute in person as it is in the picture!! Got these for my granddaughters. They are going to love them. Had them personalized with their names also. This is a great product. It's definitely worth the money. Gift for my granddaughter who will be born around Easter! Perfect!!! These are going to be a big hit stuffed with a little candy and toys for our grandkids. I filled them with little treasures. Product turned out to be better then expected and will surve the purpose of an Easter Basket very well. The Easter baskets are adorable. We had previously ordered one for each of our 3 grandchildren and with the recent arrival of two more grandchildren, it was necessary to place another order. The newest baskets are identical to the previous ones, and the order was completed and shipped with no hassles. They are a beautiful addition to our Easter decorations.
. New grandchild means one more bunny!! Just bought another for my new grandson. They are cute and easy to store. My three grandkids will each LOVE getting one of these personalized baskets for Easter. The embroidered names are crafted beautifully. The baskets are of the usual Miles Kimball quality and are so much better than ho-hum straw Easter baskets. I bought these baskets to use as favors for the ladies in my office. I will fill them, wrap them in Easter cello and have them on each person's desk when they come in for the day. I think that they are cute and it's the first time I have used personalized containers. With eleven baskets to fill the price was very attractive! 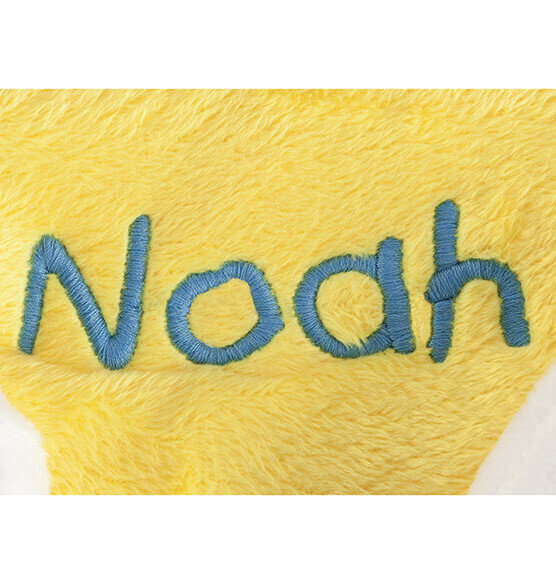 Great personalized item for a little person. Very special. The basket size is larger than it looks in the catalog which makes it perfect for holding rattles etc after Easter. I would buy these Easter baskets agin. Grandchildren used then to put their Easter eggs in them. They loved their NAMES on the baskets. They said their baskets were the prettest ones there. No one else had their names on theirs. This adorable Easter basket will become a tradition for my new granddaughter. I plan to fill it every year for her. If I knew the names of future grandchildren, I would order more. I decorate extensively for Easter and these will be adorable for the two little ones on my list. These are well worth the money. Everyone that saw them thought the were super cute & couldn't believe they were also personalized for such a low price. The kids I'm giving them to will cherish them always. Cute and nice quality at a GREAT price! This is adorable and will fit all of your Easter goodies and then some. It is well made with the added touch of having your child's name added. My little Grandson is going to love it. The only thing is it could really use a handle especially for an older child. Still great product for the price! Love his for the children for Easter, so personable! these baskets are so cute and just the right size for the easter bunny to fill. We bought two of these for each of my children many years ago. They love them! We had a third child and this year she noticed she didn't have one too and was upset, so we ordered another. We just recieved it and it has the same great quality and bright colors as the other 2 we have. I am giving it for Easter, filled with goodies. i had previously purchased 2 and loved them so order a 3rd!! Our girls will love these come Easter.Can't wait now for Easter!!! Purchased four of these for my family. They are so cute. I did have them personalized as well. Two are for female,two male. Embrodery is a nice touch. Can hold a substantial amount of candy. They are able to collapse in away for easier storing.Purchased on sale. They are great and adorable!! Nice quality. Great for the one time Easter event. I am using this as an Easter gift for a four year old girl - it holds a fair amount of goodies and seems as durable as all the Mile Kimball products I have purchased in the past. I was going to use it as my Grandchildren's Easter Basket, but it is a little small. I will fill it with goodies and get them another basket as well. With it being personnalized, they will love them. I bought 2 of these for my grandchildren for Easter...They're very cute...The only negative would be they had no handles' and they need handles..
Easter basket for grands that won't cost a fortune to fill; they will love these because the children have names that are not usually seen in personalizations unless customized. I didn't read the reviews as I usually do because the basket was too cute not to order. After seeing the basket and reading the reviews, I do agree it should have a handle; after all it is a basket. Even with saying that, I love Miles Kimball products and would order again. This is a wonderful keepsake for my grandchildren!! Small basket but cute. I little pricey. These are really cute but for some reason I thought they'd be bigger. I got these for my four children. They loved them when they saw them when I opened them. Gift for Easter, looks cute!!!! Very cute but very small!! It will work for this year, but much smaller than it appeared in the picture. The bunny baskets were OK - I had them personalized and am just going to have them for granddaughters as an extra little thing for Easter at our house. It's OK for the price that I paid. would be perfect if they had a handle!! I bought this for my great granddaughter's 1st Easter to have as a keepsake and something more personal than just a plain basket. It is really cute and made well. The colors are bright and the stitching of the name was done very well. One negative on this is the price. I think it's rather expensive (especially the shipping) for the size. I'm willing to pay more for the personalization but the shipping was as much as the basket and considering it is made of cloth and very light, I think the shipping could be much less. I also think it should have a handle as it's quite awkward to carry with anything in it - It's more for decorative purposes than actual use. I like the fact that it can be folded flat and placed in a zip-lock bag for storage. I bought this basket a few years back for my oldest grandson. Since it was so cute and the perfect size I decided to buy another my newest grandson. The basket is cute and just like the first one I bought. Unfortunately, it came in a mailing bag package and it is so squished and out of shape I am trying to straighten it out and keep the bunny from folding into the the actual basket.The name is all out of shape and the name Owen looks like Oven. Very disappointed i the way it looks. I will continue to remold it back into shape and I hope once it is filled it won't look so bad. Unhappy that there wasnt a handle for the little ones to carry it around with. That is why the best use is a decoration, not an Easter "basket", which was the intent. Bunny basket is very cute. However, a basket should have a handle. This one does not. The photo of the basekt was deceviing. This basket is way too small to put much of anything into it. Disappointed.